Battery life is one of the most important things to think about when buying a new smartphone – you don't want a handset that won't last a full day of use, or that will crumble under pressure when you try to stream movies or play games. But finding the smartphone with the best battery life isn't as easy as comparing capacity – some phones can have a huge battery pack but will burn through it fast, while other devices make the most of smaller batteries. 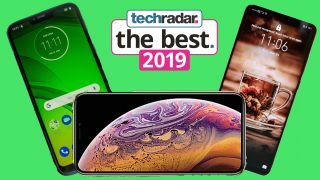 We've tested loads of handsets for our reviews, including how well they charge and if they drain battery fast when streaming media, and - in no particular order - these are our choices for the best phones with long battery lives. You'll notice there are no rugged phones on the list – we opted to neglect them as they're designed to be used for specialist tasks, so if you're looking for a smartphone for everyday use you wouldn't really consider them. Huawei's latest plus-sized phone, the Huawei P30 Pro, isn't the first handset you'd think of if you were looking for a phone with great battery power, because its quad-lens camera setup is by far the most important feature, but it also boasts a huge battery pack. The handset can easily last a full day of use, even if you're streaming films or constantly on social media, and the fantastic battery life joined with the camera capabilities makes it one of the best phones for photography. With a battery capacity of 5,000mAh, you know you're getting a long-lasting device in the Moto G7 Power, but it has a lot more to it too. It's great for gaming, and with a large display we found it great for watching content. It is a little on the big side, but you can expect that for any phone with a big power pack, and the extended battery life as a result more than makes up for it. If you're looking for a phone with great battery life because you need a great business phone, the BlackBerry Key2 is your friend. Instead of having touchscreen typing it has its own keyboard, which means a smaller screen, so with that alongside the sizeable 3,500mAh battery it can last for between 25 and 35 hours of use – enough to do all the business work you need. The Samsung Galaxy S10 Plus is another plus-sized high-end smartphone with a huge battery pack, but it really comes into its own with its quick wireless and reverse wireless charging, so you can easily trade juice between devices on the fly. If you want to use the handset at its full QHD+ resolution you'll need this extra battery life, but in general we could use the Galaxy S10 Plus all day without needing to charge it, so it's definitely one of the best phones for battery life. The Huawei Mate 20 Pro is definitely one of the most premium devices on this list, with features like a great camera array and a powerful chipset, but it also boasts one of the best battery lives in a phone. At 4,200mAh capacity, the handset can keep going for a day easily, but included with it is a 40W supercharger and it supports wireless charging, so you can easily top up on the fly too. Like the Moto G7 Power, the Moto E4 Plus has a huge 5,000mAh battery pack, but because it's an older low-end phone you're less likely to be using it for really intensive tasks, so it can easily last for two days without charging. There's no bells and whistles like wireless charging, and unless you use the charger included in the box it's pretty slow to power up, but as an endurance device it's one of the best phones around. iPhones aren't normally known for being great devices for battery life, and the 2,716mAh power pack in the iPhone X would seem on paper to be tiny compared to other phones on this list. However, Apple devices are optimized so you can barely tell the battery capacity is half that of the bigger Moto batteries – the iPhone X performed admirably in our battery test, and you can comfortably use it for a full day between charges just like any bigger-battery rival. Yes, it's surprising to see not one but two BlackBerry phones on a list starting with 'the best', but the BlackBerry Motion does not die. It will never run out of battery, and its design is close enough to indestructible. That's hyperbole, of course, but only just – with a massive 4,000mAh battery, and a relatively low resolution display, the Motion easily lasted two days without charging, and when we did need to power it back up it did so easily and quickly. The fact there are three Motorola phones on this list shows the company knows how to make the best phones for battery life. Unlike the G7 Power and E4 Plus, which both have a 5,000mAh power pack, the Moto E5 only has 4,000mAh, but its rather low-end specs mean you probably won't be using it for demanding tasks, so it lasts for ages. Specs aren't all that important in big battery phones if you just want them for social media or communications, so being low-end isn't necessarily a problem. The iPhone XS has an even smaller battery capacity than the iPhone X, but it does have a secret weapon in the A12 Bionic chipset. The processor optimizes processes to make sure everything from streaming media to taking photos doesn't drain your battery too much, so you can expect the iPhone XS to keep chugging along through all kinds of activities.